For those who loved the Ghostbusters movies you’ll feel like you’re in them. You’re a part of the team as you play the new recruit named “rookie”. They named you rookie so they don’t get too attached to you. Since you have the least seniority, you get the honor of testing all of their experimental equipment. 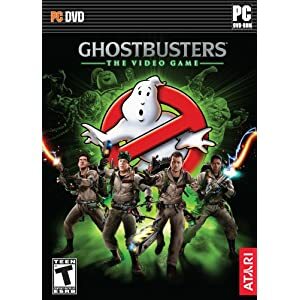 Ghostbusters: The Videogame stays true to the characters and environment, and all of the original voice actors reprise their roles. The game begins in the museum where there is a new Gozer exhibit which is haunted, and opens a portal for the undead to invade our world. The Ghostbusters must stop this chaos and close all of the entrance points from the spirit world into our own. Many of the same allies and enemies are back. Mr. Peck still hates the Ghostbusters with a passion and will try his best to shut them down. The mayor is still on your side but doesn’t want the city destroyed. Strong Points: This game is true to the movie series. Excellent graphics and voice acting. When it comes to catching ghosts you’ll earn and cost the team money. The money you earn can be spent on many useful upgrades. I don’t think there is any penalty to destroying anything; the game just makes you aware of it. The upgrades include more powerful weapons, faster ghost traps, and personal damage reducing abilities. Most of the game is in the third person perspective. When you use the PKE meter to scan your surroundings it switches to first person. You can scan ghosts into the database to identify their weaknesses and you get money for doing so. Another way to make money is to collect haunted artifacts. You can only find them by using the PKE meter. The PKE meter gives you night vision which comes in handy since many ghosts like dark areas. When you’re not scanning for ghosts, you’re catching them. The catching part is done in third person and it’s a three step process. First, you have to weaken the foul being. Then you have to deploy your trap near them. Lastly you have to capture the apparition with your proton beam and hold them by the trap for a few seconds. If the ghosts are feisty you can slam them around a bit to weaken them some more. Later you can buy an upgrade that instantly catches them if you slam them into the trap. Most of the time you’ll have backup, but some missions you have to do by yourself. When you’re fighting with your team, you can revive each other if you get knocked out. If everyone is defeated, the mission fails and you have to load from the last check point. Unfortunately, there are no quick saves. I learned that the more team mates that are with you, the more challenging of an enemy awaits you. The whole gang is there to help with bosses. The AI is pretty good and they definitely carry their weight. The graphics are top notch and the characters all look like they did from the movie. The levels are incredibly detailed and you feel like you’re in the movie. Many of the same locales return including the Hotel Sedgewick where Slimer was originally found and returns to in this game. The bosses look unique and they each have their strengths and weaknesses that you get to figure out. There’s a definite eerie feel in this game and it really immerses you into it. The audio is great as well. You’ll obviously hear the theme song, but I was impressed that they got all of the original voice talent back for this game. Unfortunately the lip syncing wasn’t perfect but it’s forgivable. The background music fits perfectly and speeds up as you encounter lots of ghosts. From a moral perspective, you’re obviously dealing with the undead and supernatural powers. As the story unravels, the Ghostbusters uncover an influential family that was heavily into the occult. Fortunately I didn’t recognize any real occult symbols. There is some language as I heard the D word a couple of times. The Xbox 360 and Playstation 3 versions of this game offer multiplayer where up to three different players can play new missions. The Wii version offers split-screen co-op play for the single player campaign. The Xbox 360 and PS3 versions also offer unlockable achievements and trophies. The DS version is completely different and was developed by a different team. The DS version sports an ESRB rating of E.
I played the PC version so I didn’t get to experience the multiplayer. The game play only lasted roughly ten hours for me. I played at the experienced level so the only replayability for me would be to play it on the professional level. I got this game on Steam for $4 and it was worth every penny. If you can find this game on sale and aren’t afraid of ghosts…you know who to call.